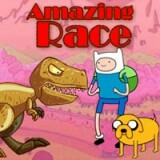 Finn and Jake invite you to take part in the most fantastic race! Are you already fascinated? So, do not waste your time and beware of all impediments on your hard way to the win! Run as fast as possible and you may vanquish this game!